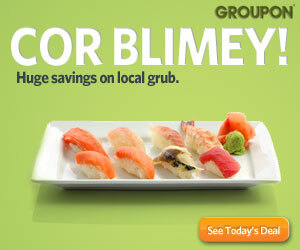 Do not miss another Orbitz voucher! Simply leave your e-mail address and we'll always keep you informed of new vouchers for Orbitz. Offer condition: Book a qualifying hotel between April 28, 2014 12:01AM CST and April 30, 2014 11:59PM CST, for 1 or more nights for travel between April 28, 2014 and September 30, 2014, via Orbitz and instantly receive 15% off through the use of the promotion code. Limit one discount per hotel room and one promotion code per booking. Discount may not be used toward the booking of a vacation package. Discounts are not redeemable for cash for any reason. Promotion codes are non-transferable, not for resale, and cannot be combined with other offers. Any attempt at fraud will be prosecuted to the fullest extent of the law. Void where prohibited, taxed or restricted. Orbitz reserves the right to change or limit the promotion in its sole discretion. Most major chains are excluded, to find participating hotels look for the "PROMO CODE ELIGIBLE" message. Offer condition: Book a qualifying hotel between April 9, 2014 12:01AM CST and April 13, 2014 11:59PM CST, for 1 or more nights for travel between April 9, 2014 and September 30, 2014, via Orbitz and instantly receive 15% off through the use of the promotion code. Limit one discount per hotel room and one promotion code per booking. Discount may not be used toward the booking of a vacation package. Discounts are not redeemable for cash for any reason. Promotion codes are non-transferable, not for resale, and cannot be combined with other offers. Any attempt at fraud will be prosecuted to the fullest extent of the law. Void where prohibited, taxed or restricted. Orbitz reserves the right to change or limit the promotion in its sole discretion. Offer condition: Book by March 31, 2014, travel by June 30, 2014. Offer condition: For 1 or more nights for travel between February 24, 2014 and September 30, 2014, via Orbitz and instantly receive 20% off through the use of the promotion code. Limit one discount per hotel room and one promotion code per booking. Discount may not be used toward the booking of a vacation package. Discounts are not redeemable for cash for any reason. Promotion codes are non-transferrable, not for resale, and cannot be combined with other offers. Any attempt at fraud will be prosecuted to the fullest extent of the law. Void where prohibited, taxed or restricted. Orbitz reserves the right to change or limit the promotion in its sole discretion. Offer condition: Book a qualifying hotel between January 31, 2014 12:01AM CST and February 23, 2014 11:59PM CST , for 1 or more nights for travel between January 31, 2014 and June 30, 2014, via Orbitz and instantly receive 15% off through the use of the promotion code. Limit one discount per hotel room and one promotion code per booking. Discount may not be used toward the booking of a vacation package. Discounts are not redeemable for cash for any reason. Promotion codes are non-transferable, not for resale, and cannot be combined with other offers. Any attempt at fraud will be prosecuted to the fullest extent of the law. Void where prohibited, taxed or restricted. Orbitz reserves the right to change or limit the promotion in its sole discretion. Most major chains are excluded, to find participating hotels look for the "PROMO CODE ELIGIBLE" message. Offer condition: Book a qualifying hotel between January 31, 2014 12:01AM CST and February 16, 2014 11:59PM CST, for 1 or more nights for travel between January 31, 2014 and June 30, 2014, via Orbitz and instantly receive 15% off through the use of the promotion code. Limit one discount per hotel room and one promotion code per booking. Discount may not be used toward the booking of a vacation package. Discounts are not redeemable for cash for any reason. Promotion codes are non-transferable, not for resale, and cannot be combined with other offers. Any attempt at fraud will be prosecuted to the fullest extent of the law. Void where prohibited, taxed or restricted. 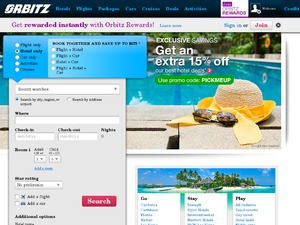 Orbitz reserves the right to change or limit the promotion in its sole discretion. Most major chains are excluded, to find participating hotels look for the "PROMO CODE ELIGIBLE" message. Offer condition: Palace Resorts package deals Mexico. Offer condition: For 1 or more nights for travel between December 16, 2013 and June 30, 2014, via Orbitz and instantly receive 20% off through the use of the promotion code. Limit one discount per hotel room and one promotion code per booking. Discount may not be used toward the booking of a vacation package. Discounts are not redeemable for cash for any reason. Promotion codes are non-transferable, not for resale, and cannot be combined with other offers. Any attempt at fraud will be prosecuted to the fullest extent of the law. Void where prohibited, taxed or restricted. Orbitz reserves the right to change or limit the promotion in its sole discretion. Valid for: Las Vegas, NV. Offer condition: For 1 or more nights for travel between November 18, 2013 and June 30, 2014, via Orbitz and instantly receive 20% off through the use of the promotion code. Limit one discount per hotel room and one promotion code per booking. Discount may not be used toward the booking of a vacation package. Discounts are not redeemable for cash for any reason. Promotion codes are non-transferable, not for resale, and cannot be combined with other offers, unless otherwise stated. Any attempt at fraud will be prosecuted to the fullest extent of the law. Void where prohibited, taxed or restricted. Orbitz reserves the right to change or limit the promotion in its sole discretion. Most major chains are excluded, to find participating hotels look for the "PROMO CODE ELIGIBLE" message. Offer condition: Book a qualifying hotel between October 19, 2013 12:01AM CST and November 22, 2013 11:59PM CST, for 1 or more nights for travel between October 19, 2013 and March 31, 2014, via Orbitz and instantly receive 15% off through the use of the promotion code. Limit one discount per hotel room and one promotion code per booking. Discount may not be used toward the booking of a vacation package. Discounts are not redeemable for cash for any reason. Promotion codes are non-transferable, not for resale, and cannot be combined with other offers. Any attempt at fraud will be prosecuted to the fullest extent of the law. Void where prohibited, taxed or restricted. Orbitz reserves the right to change or limit the promotion in its sole discretion. Most major chains are excluded, to find participating hotels look for the "PROMO CODE ELIGIBLE" message. Offer condition: Book a qualifying hotel between November 11, 2013 12:01AM CST and November 17, 2013 11:59PM CST, for 1 or more nights for travel between November 11, 2013 and March 31, 2014, via Orbitz and instantly receive 15% off through the use of the promotion code. Limit one discount per hotel room and one promotion code per booking. Discount may not be used toward the booking of a vacation package. Discounts are not redeemable for cash for any reason. Promotion codes are non-transferable, not for resale, and cannot be combined with other offers. Any attempt at fraud will be prosecuted to the fullest extent of the law. Void where prohibited, taxed or restricted. Orbitz reserves the right to change or limit the promotion in its sole discretion. Most major chains are excluded, to find participating hotels look for the "PROMO CODE ELIGIBLE" message. Offer condition: For 1 or more nights for travel between October 30, 2013 and November 30, 2013, via Orbitz and instantly receive 24% off through the use of the promotion code. Limit one discount per hotel room and one promotion code per booking. Discount may not be used toward the booking of a vacation package. Discounts are not redeemable for cash for any reason. Promotion codes are non-transferable, not for resale, and cannot be combined with other offers. Any attempt at fraud will be prosecuted to the fullest extent of the law. Void where prohibited, taxed or restricted. Orbitz reserves the right to change or limit the promotion in its sole discretion. Most major chains are excluded, to find participating hotels look for the "PROMO CODE ELIGIBLE" message. Latest voucher code valid at a time of promo publication was entered to be working from 2014-04-14.